Why hasn't he signed yet?! 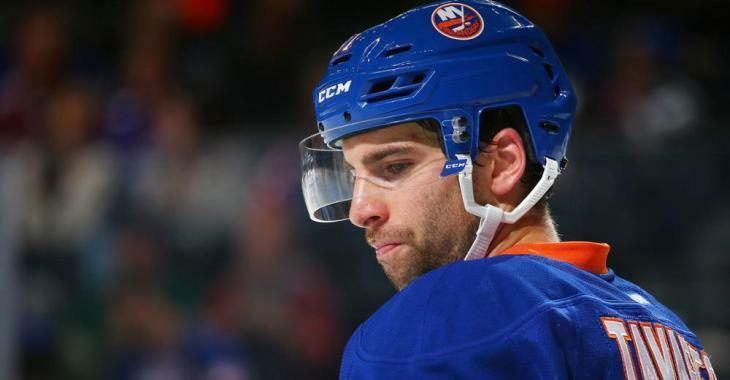 The 2017-18 season is well underway, and the New York Islanders and captain John Tavares have yet to sit down and talk about a lengthy contract extension for the superstar. While Isles management could have already presented an eight-year deal extension to Tavares, who is set to become a free agent in July, the 27-year-old is still waiting to get more details on the potential new arena and to see if his team can become an actual true Cup contender for seasons to come. According to NHL insider Pierre LeBrun, who spoke on TSN's Insider Trading last night, at this point Tavares looks like a guy making excuses. "I chatted with him on Wednesday in Uniondale and the more you talk to John Tavares, the more it sounds like he’s a guy that’s making excuses to stay put rather than leave which is not necessarily a guarantee that he will stay but the one thing he told me was that he needs more time." Once again, several elements are to be taken into consideration when it comes to Tavares' future in New York, and the top forward wants to make sure he makes the best decision of his career. He could wait once the season is over to make his final choice. "When I made that point to him he said “Not necessarily, I’m keeping all options open including a conversation during the season," added LeBrun. The Islanders are doing much better now, especially since the addition of Jordan Eberle during the offseason. Tavares has recorded 16 goals and 28 points in 24 games with the Islanders, who sit 8th in the League with a 15-7-2 record.